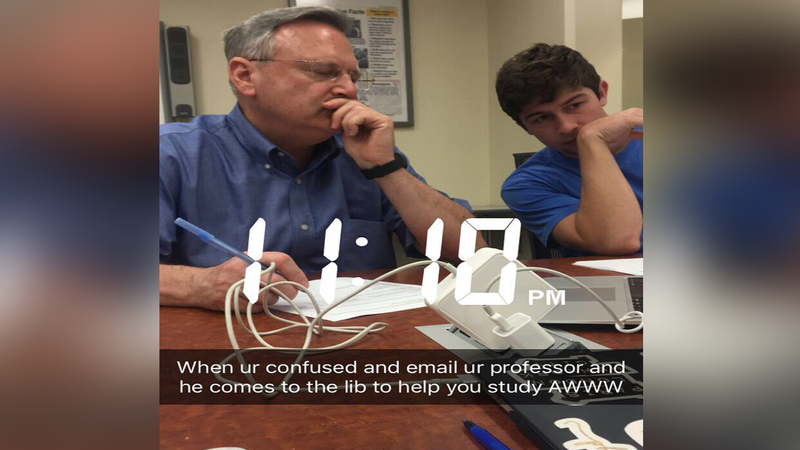 GREENVILLE, North Carolina (WTVD) -- An East Carolina University professor is getting lots of praise on social media for going above and beyond for his students who needed help during a late night library study session. On October 5, accounting professor, Dr. Doug Schneider, got an email from his students asking for advice on some material in their course. Instead of just replying to the email, Schneider went over to the library and helped them work through the exercise. One of the students, Marissa Flood, was so moved by what her professor did, she snapped a photo and shared it on twitter saying, "Sometimes ya just gotta appreciate professors who do everything possible to help you succeed." The tweet has since gained over 34,000 likes and has been retweeted more than 6,000 times. Even Schneider's niece praised her uncle's actions. She replied to Flood's tweet saying that her uncle "loves what he does" and that he "loves his students." ECU also saw Flood's post and retweeted it saying, "We may be a big school but it's the little things that make it home!" We may be a big school but it's the little things that make it home!